A classic 9ct yellow gold curb bracelet measuring 8.5" and finished with a lobster clasp fastening. Simple, versatile style for him. 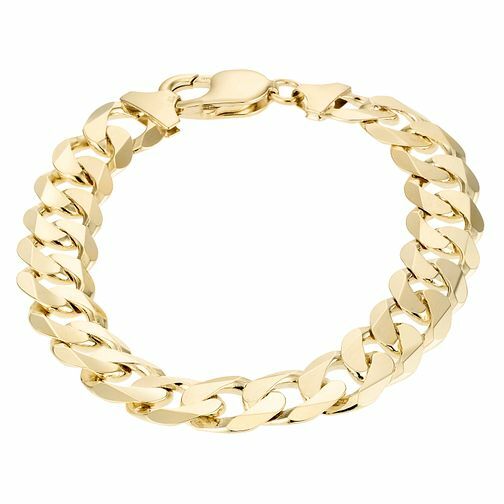 9ct Yellow Gold Men's 8.5" Solid Curb Bracelet is rated 5.0 out of 5 by 2. Rated 5 out of 5 by Anonymous from Very pleased with the bracelet The bracelet was a gift for my husband we are both really pleased with the quality of the bracelet. There is one area that that I feel let’s it down a little bit because it could be a weakness in the design. The small ring attaching the clasp to the bracelet, it could of been a more chunky ring more in keeping with the bracelet.